Oh my, what a lovely, unusual, and thoroughly filthy clock! I’ve discussed “barn finds” before - clocks that have sat in an attic, or a barn for many, many years; time capsules from when they were last hung. This piece is just such a clock - clearly it has not been run in many years, judging by the fine layer of dust overlaying the top half of every bit in the mechanism. The thing that amazes me about such finds is how wonderfully they come “back to life” when cleaned, waxed, and have the mechanisms serviced. In the case of this clock the finish is in very good condition under all of that grime, the mechanism, while filthy, shows no rust and will be a pleasure to restore. And then there are those lovely, delicate, and oh so feminine appliques to the dial, pendulum bob and weights. If you are interested in this clock - e-mail me, I will send you the original files for the shots of this piece - the detail that you can discover when blowing up the 1 megabyte photos is phenomenal! It will help you understand how truly rare of condition this clock is in. The Gustav Becker mechanism has the distinctive double-circle logo for the Braunau factory, and a serial number of 392941. This clocks trademarks list both the Freiburg and the Braunau Becker factory locations (FREIB. i. SCHL., BRAUNAU i. BOEHM), telling us it was produced in Braunau, Bohemia. The references seem to agree that the factory was started in 1888, in the former Austrian - Hungarian Danube Federation of Braunau. John Hubbby’s excellent reference provides us with a date for this clock of 1902. Braunau (now Broumov, CSR) was annexed by Czechoslovakia after World War I. Interestingly, a 231 pound meteorite hit a home in Braunau in 1847. 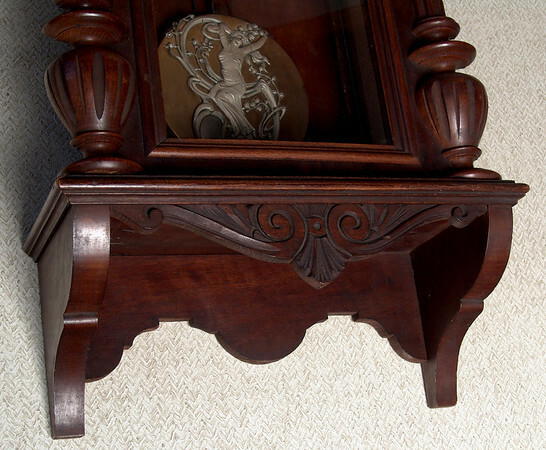 The figures on the various clock parts are cast, not simply pressed pieces, and all are in wonderful condition. Unusual? Yes! It is the first piece that we have offered with such adornments. Can you imagine how “up to date” this clocks was when new, what with the decadent (and delightful) abandon of the period when so many new ideas were coming out of Europe. The case is in very good condition, the finish original, the brass trim extremely tarnished, but very complete - everything is ready for a good cleaning. Several things to note - the piece strikes on straight steel gongs: these later Beckers are rather quiet strikers, but have a deeper sound - we quite like them - but they will not compete in volume with anything made in America. The glass is all old, with more dimples and bubbles than the norm, the beatscale, wall stabilizers, winding key and embossed pulleys all original and in good condition, the port-hole case with its applied brass trim ever so German, quality carving and turnings to the door columns, original headpiece - this clock is very complete, original, and, did I mention filthy?